Chris comes from a whitewater kayaking and rafting back ground where he worked as a guide/instructor for 11 years. 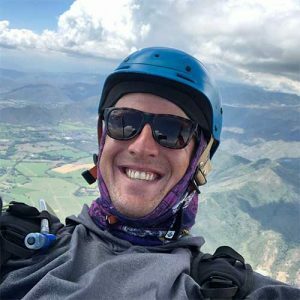 He found himself looking for a more fulfilling path in life and picked up paragliding. It was obvious that as Chris progressed as a pilot he would one day want to teach and be more involved. He runs the Eagle Paragliding brick and mortar shop in Santa Barbara. As shop manager Chris sees all kinds of duties. His background organizing multiple rafting trips daily helps with the paragliding logistics at Eagle. He is a true team player, and is always there showing everyone what community is all about. Skills – Management and Logistics, Cross Country, Tandem Instruction(soon), Presentations, Glider Trimming, Glider Repair, Reserve Repacks, Inspection and Maintenance.